Megan met me inside the train station with a huge hug. You may remember Megan from such previous stories as “Adventures in Guatemalan Karaoke” and “How I Almost Passed Out at Palm Sunday Mass.” She was a fellow Spanish student while I was staying in San Pedro de Atitlán last spring, and we have kept in touch over the last year. And here she is with Ken from Chicago! We threw my luggage in the car and headed to Boulder, only about a 40-minute drive away, where Megan lives with her husband, Craig. It was my first time driving near the Rockies, and the scenery was breathtaking. But first, let’s take another look at the awesome Denver station sign! The drive to Boulder. Warm weather and no local snow in sight. After showering away the grunginess from my overnight train ride, Megan and I returned to the car along with her dog Jameson and another little cutie, JTag, whom Megan was pet-sitting for the weekend. We took advantage of the beautiful weather and headed to the park, where Megan’s friends slack-lined, the dogs looked on, and I promptly passed out on my sarong on the ground. Perhaps I had not slept as well as I thought on the train! Afterwards, we dropped off the dogs and stopped downtown for margaritas and nachos. Sadly, neither the view from the rooftop deck nor the cool weather could keep me awake, so we stayed in the rest of the night watching movies. I promised that I would have more energy after a real night’s sleep that was NOT in a moving vehicle. The next morning, I felt 100% better. Megan and I had decided to make a day of free factory tours. 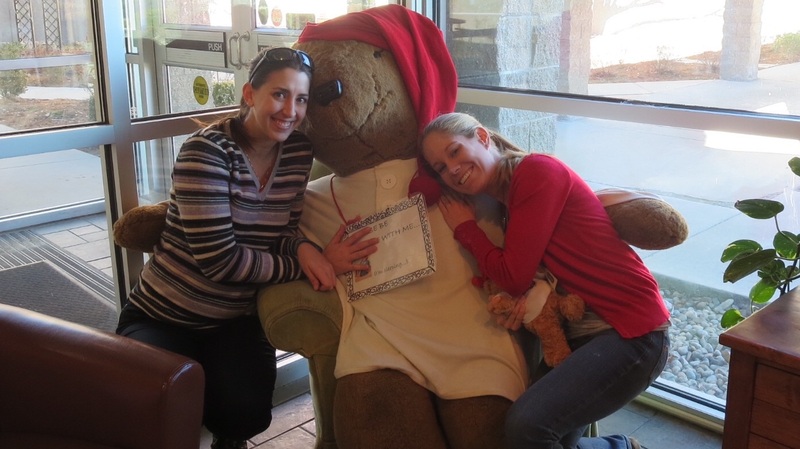 We started off in Boulder at the Celestial Seasonings tea factory. Megan has done this MANY times but still welcomes the opportunity to take another tourist friend there, because hey, free tea! Delicious! We were checked in at the front desk and given a packet of tea as our “ticket.” Inside is a gallery with all of the whimsical framed artwork used on the tea packages as well as a tea bar, where you can sample as many cups as you want of any of Celestial Seasonings’ dozens of flavors. Yum. Part of the artwork in the gallery. Reminds me of a challenge on Project Runway. The tea bar. I had no idea there were this many flavors. I tried to pick the unusual ones. Once we put on our hair nets (super classy) and watched a short video, we were taken through a tour of the facility. There was no production happening that day since it was a Sunday, but it was still really interesting to walk through the warehouse and get whiffs of all the different ingredients as you walked along. First peach, then chamomile, then maybe licorice root or vanilla. Megan’s absolute favorite is The Peppermint Room: because of the strength of the mints’ oils, CS has to keep all of the peppermint, spearmint, and catnip (apparently this is also in the mint family. Ya learn something new every day!) sequestered in a separate room of the warehouse to prevent scent and flavor contamination of the other ingredients. Upon entering the room, it took about 30 seconds for the pleasant but potent minty smell to clear our sinuses and make ours eyes water. Mmm…hurts so good! Although it was late in the afternoon, we were able to make it into one of the last tour groups of the Coors Brewery. I have done brewery tours before (hello, Sam Adams! ), but never one on this grand a scale. I love the warm, earthy smell of brewing beer. And the best part: a few free samples at the end. Megan travels extensively (she and her husband recently returned from Sri Lanka, India, and the Maldives on their honeymoon. Girl puts me to shame! ), and apparently, so did our Coors bartender, so we practically closed down the bar talking like the travel fangirls that we are :). We woke up at the crack of dawn on Monday so that I could catch my train from Denver to Emeryville, CA, the final leg of the trip. Miraculously, we did not encounter too much traffic on the ride there. It was so good to be able to spend some time with Megan and Craig. It never ceases to amaze me how close you can feel to people after knowing them for such a short time. You guys are welcome in Cleveland anytime! Megan and I hugged goodbye, and I went inside to squeeze in some final photos of Union Station before my ultimate train journey -through the Colorado mountains and Nevada desert- began. Hmm…tempting pastries, but I’ll stick with my oatmeal cup, thank you.